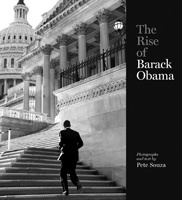 Notes | Award-winning photojournalist, Pete Souza, documents the meteoric rise of the charismatic Barack Obama from his first day in the U.S. Senate right up to the Pennsylvania presidential primary. More than 80% of these candid and stunning photographs capturing private and political moments have not been seen before. Souza provides extended commentary about each photo to place it in context, and describe the scene and participants. Photo-by-photo the viewer is allowed to examine the senator and candidate’s path to the very cusp of history. Comments | [10/28/11] A great book that gets provides a behind the scenes view of Obama's march to the White House. Comments | [08/29/08] Pete has put together a wonderful book here. Perfect timing and terrific photographs mean this book should do well. With all the great publicity Pete and the book are getting on the national TV shows he will need a second printing soon! Comments | [07/17/08] Picked up my copy today, nothing short of fantastic. Great documentary work. Inspirational to say the least. So good in fact, it prompted me to complete this, my first book review on SS.com. Comments | [07/14/08] I received mine today. Pete Souza has my admiration for doing such a fantastic work and so very timely! Comments | [07/09/08] Pete's book arrived today. On par, if not better, than his books on President Reagan for visual reporting. Beautiful reproduction. Haven't read the text yet since it just arrived. Wanted to give my first impression.